What are you building at CarverFest 2016? Re: What are you building at CarverFest 2016? What he said the board is fully populated but will get 2 parts changes the designer suggested. I do like the backlit tube idea Bob used in the Sunfire VTCC and may employ it here if I can get it to function noiselessly. 8 tubes gotta look good lit up that way. IIRC I mentioned it powered up and passed a 1khz test tone. Now to get it in a chassis and sort it out properly. I did notice I had 2 12AU7s instead of the full compliment of AX7s. 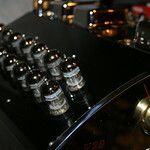 I have some really nice tubes and can't wait to compare it to the Fosgate Signature. I plan to tube and run the Aikido tube stage up this evening after I get the rig set back up as work has consumed me of late. Ray could you post some pictures of it if you have it completed? Also, if you have a thread about this build elsewhere please post a link. I'm interested in building this tube phono stage for the Marshall w/CF linestage combo. Russ, I'll post some pics when I get ready to start work on the chassis install.